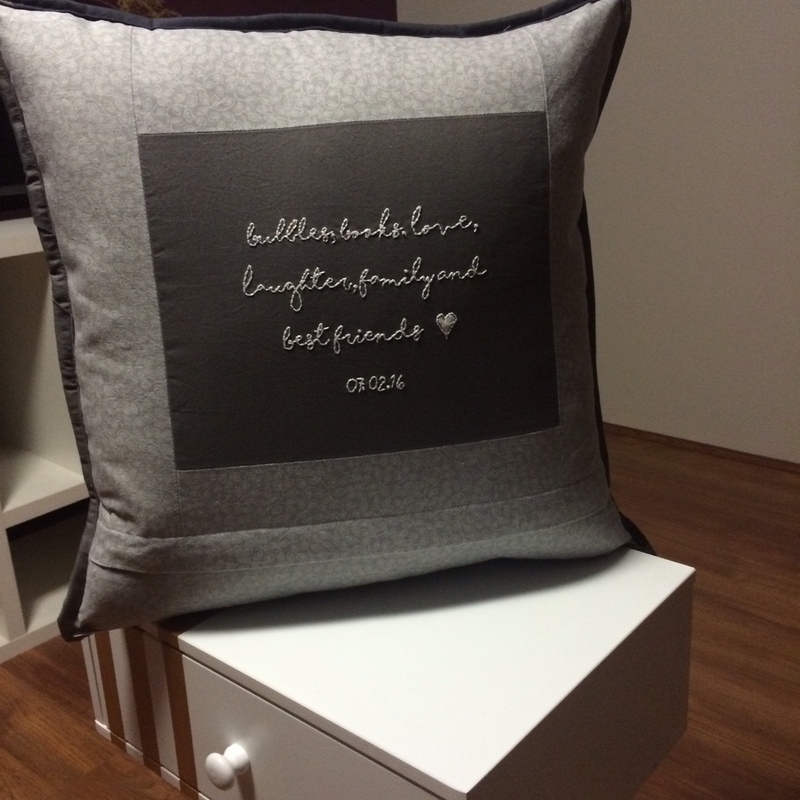 My latest commission is inspired by the book,’ 50 Shades of Grey,’ – 2 best friends commissioned a cushion for their 3rd best friend who is an avid reader, and loves the writing style of 50 Shades of Grey. 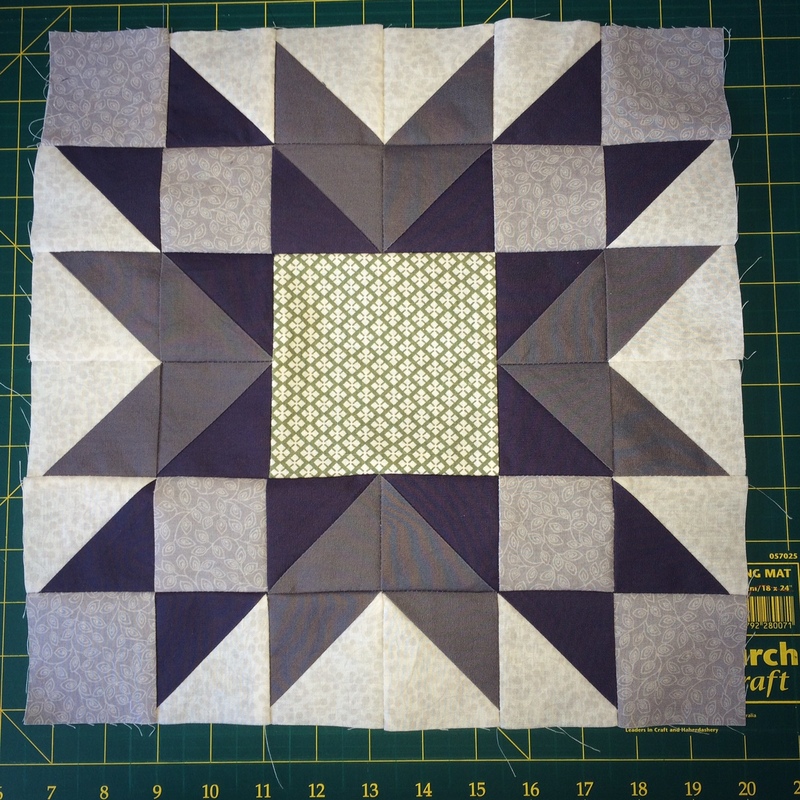 I would’ve loved to have pulled 50 shades of grey to create a pattern, but unfortunately each of the fabric stores I visited had a very limited selection of greys, and due to the timeframe of this commission I was only able to pull 5 shades. The room this cushion is going into is quite classic, so I played with the shades to create a destructed star pattern, just using HST’s. There is a green chair which features in her bedroom, so I pulled a green pattern fabric as the centre for the cushion – here’s what the top looks like. I then added a border of the same green fabric to tie it into the chair, and tried to mitre the corners for the first time. 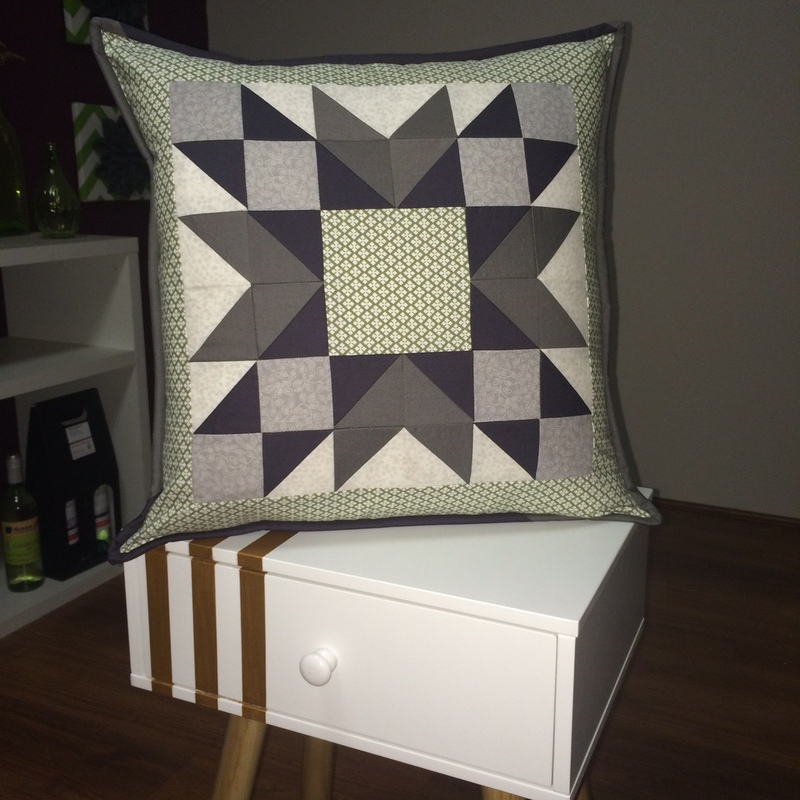 I usually have blocks as the border for cushions, but thought I’d give it a go for this cushion and used this blog for instructions. I’m sort of happy with how the corners turned out, but I’m going to practice a bit more before I try my hand at the next one. 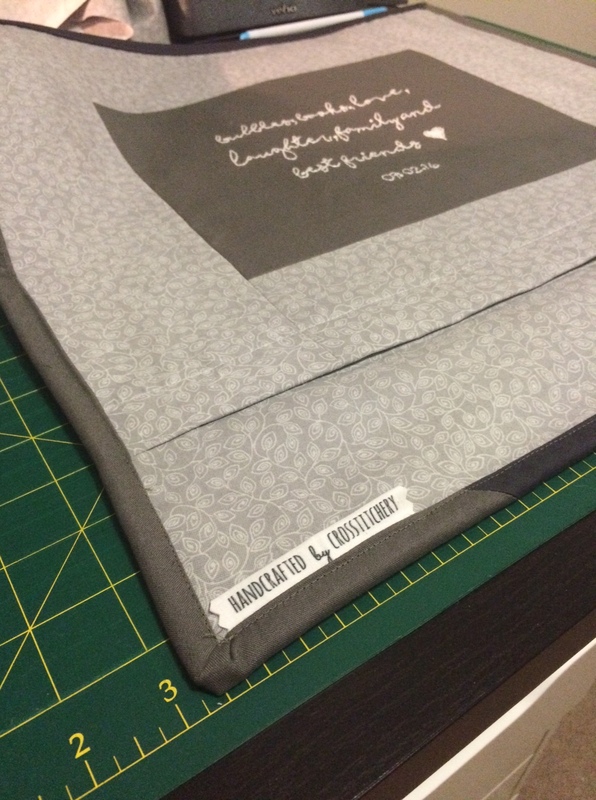 Awhile ago I posted about Spoonflower and custom fabric for having had tags made to sign my work. I’ve been really slack with adding these, as a large part of me felt like I shouldn’t for custom orders. After speaking to a few people though, I’ve realised that I should sign my work in some way – a lot of time and effort goes into these pieces! So I stitched my tag into the binding of this cushion, and I’m happy to say it’s discreet. 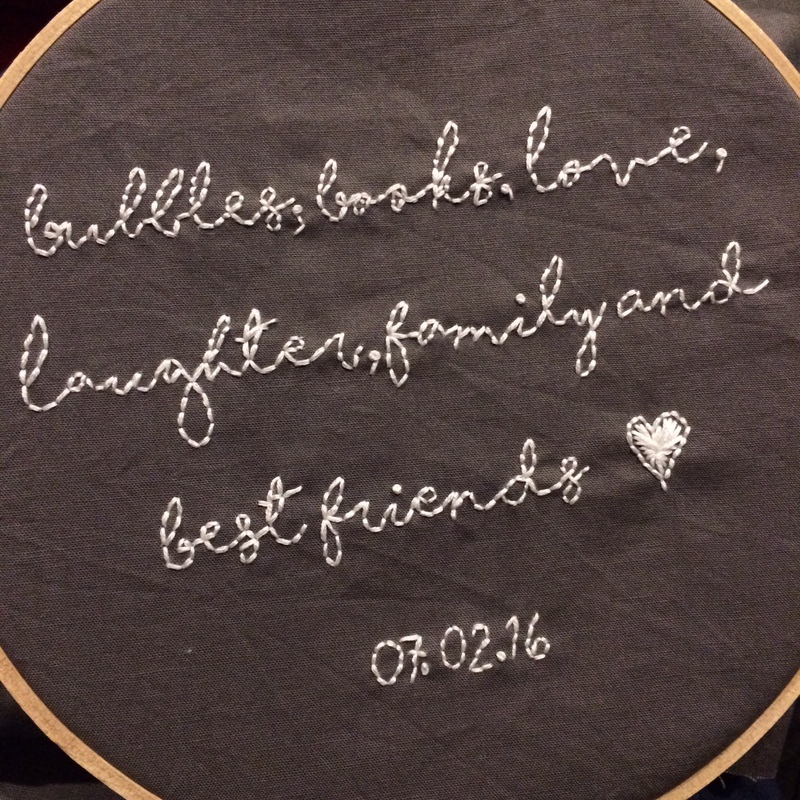 I stitched it into the bottom, so you can’t really see it unless the cushion is sitting on it’s front. It likely won’t get seen much, but I feel a lot better having my tag on my work. yes!!! you should always tag your work. I’m kicking myself that I haven’t been doing it lately, honestly! I’ll definitely be adding them from now on that’s for sure. Beautiful pillow! Love all the grays you chose. And I am happy to hear that you tagged your work and hope that you will do so from now on. Great job!